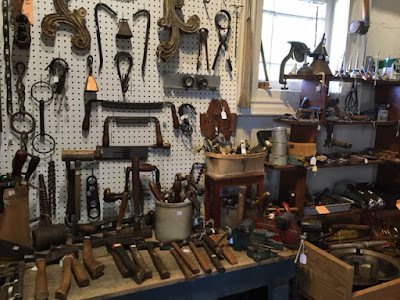 A hunt for iron crib corner, rods brought me "down the hatch". But let me backtrack, I headed out to Chamblee Antiques Row in search of these crib rods. 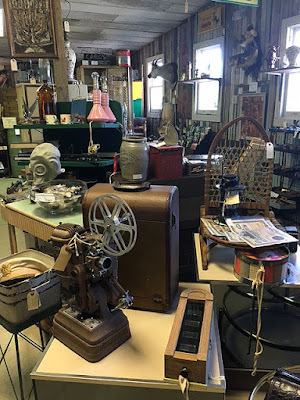 Known for their numerous antique shops, I was certain I would find them there. It had been a few years since I have visited and sadly, it is nearly vacant of stores these days. 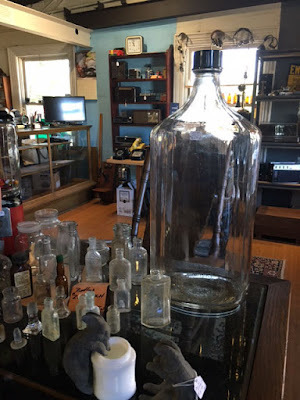 In fact, only a small handful, scattered about, remain. 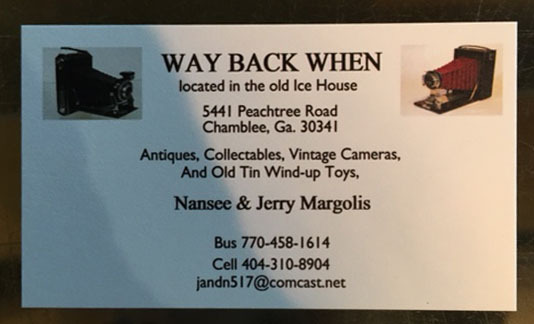 As I drove away, I did notice a new store called "Way Back When" in the "Ice House" so I decided to stop in and check it out. 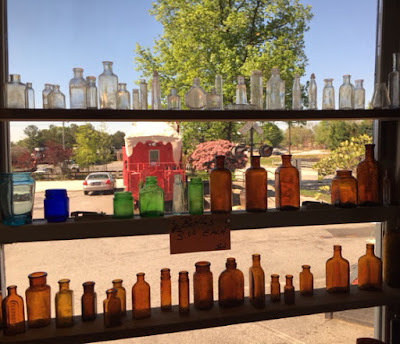 Don't let the size of the store front fool you, it is larger than it appears, and inside is pure joy and owner, Jerry Margolis, (wife Nansee, was not on site) was welcoming and knowledgeable about all that lies within. Filled with "real antiques", there is truly something for everyone. Hoping that the crib rods I needed were hiding within, but alas, Jerry did not have any. Somewhere between our conversation, Dante's Down the Hatch, in Underground Atlanta became a notable topic. 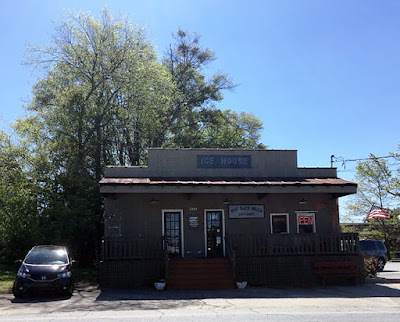 Before my high school prom, my date and I dined at Dante's Down the Hatch. It truly is a small world we live in as Jerry Margolis was none other than the General Manager for 40 years. Dante's was the "IT" place to go in the 1970s and I remember lines out the door and up the stairs with folks waiting to get in. Fondue and great music was the signature. 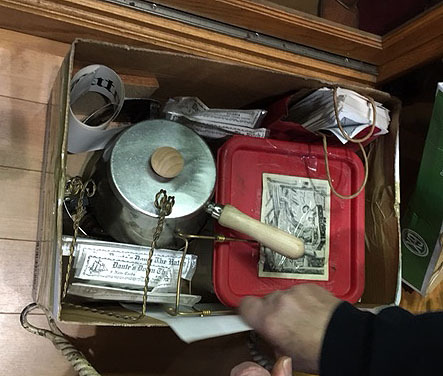 Now closed, Jerry shared a little Dante's history with me as he pulled out a box of one of the original fondue pots, note cards, postcards and matchbooks. Talk about a walk down memory lane. Marvelous, advertising medicine bottle is huge. 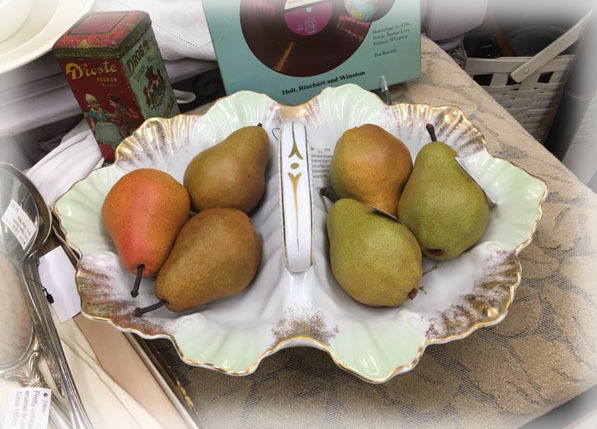 What a fun display piece. 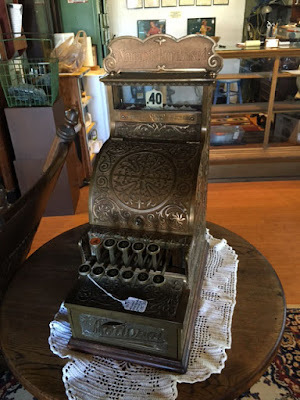 Swooning over this stunning brass cash register. What "Way Back When" boasts is the amount of items in various themes. Numerous tools for the collector or the craftsman. 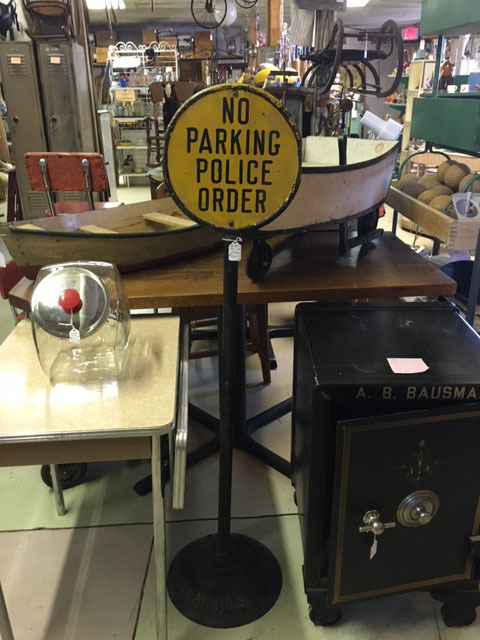 Love this police order stand. I remember these growing up as a little girl in New Jersey. 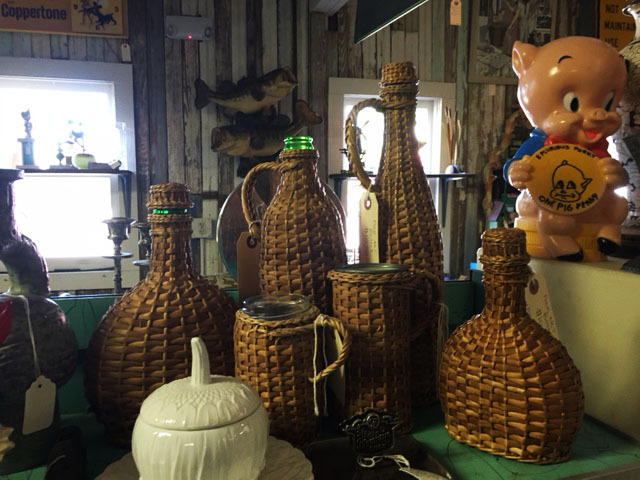 Love this display of vintage bottles covered in woven cane. Fantastic antique doctor's bag and it's in marvelous shape. 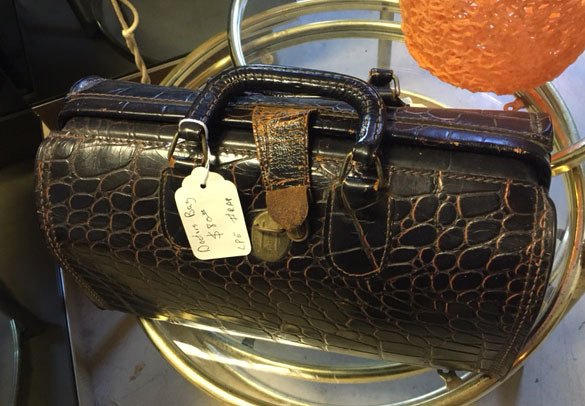 Great gift for a physician. I am head over teakettle in mad love with this condom dispenser. How fun would it be to put this in a guest bathroom. Beautiful set of lawyers bookcases but the real jewel is the corner locking doors in the middle of the bookcases. 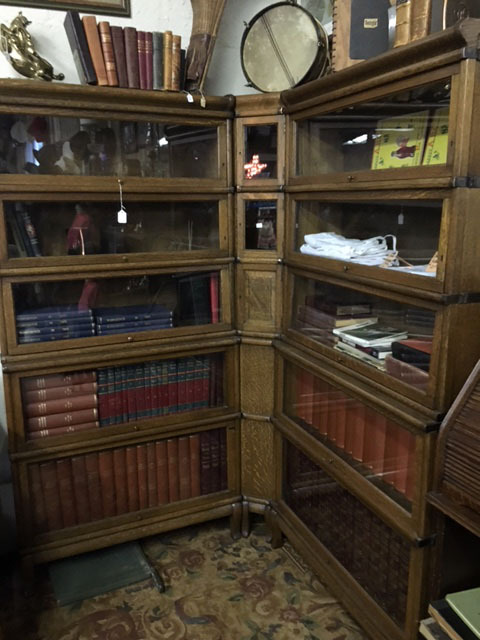 Haven't seen one of these in decades and this unit would look impressive in an attorney's office. "Camera row" looks like I walked into a camera store. 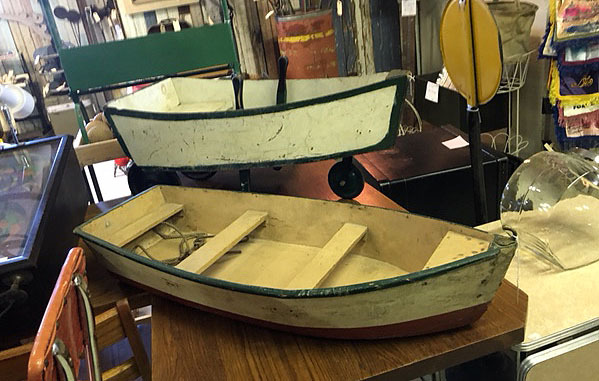 Be still my water loving heart, I am swooning over these two pieces, but especially the little boat in the back on wheels. Even the windows are filled with pretty pieces. If you are in the Chamblee, Georgia area, a stop at Way Back When, in the Ice House is a must do. 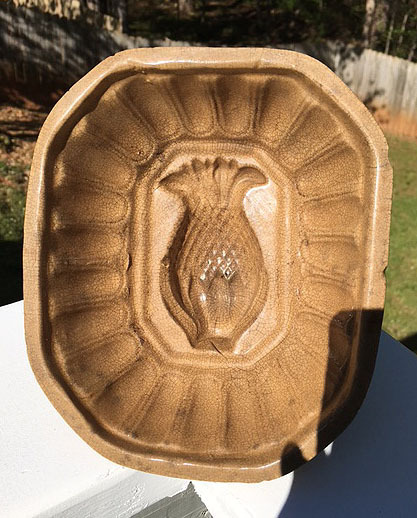 I collect antique pudding molds and I found this lovely mold with a pineapple at Way Back When. I will be making a Christmas pudding in this mold over the holidays. 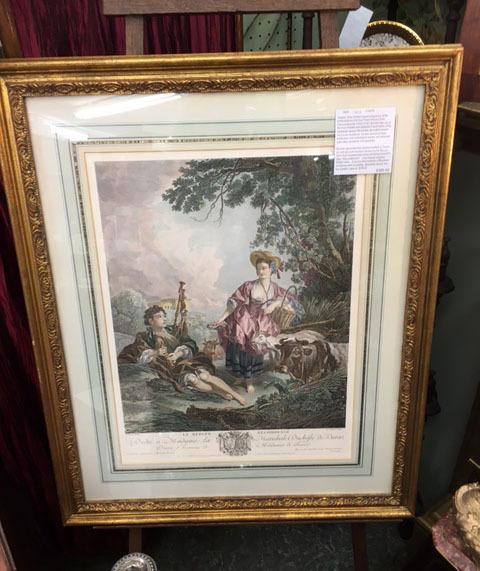 A thrift store find, beautifully framed, hand colored print. 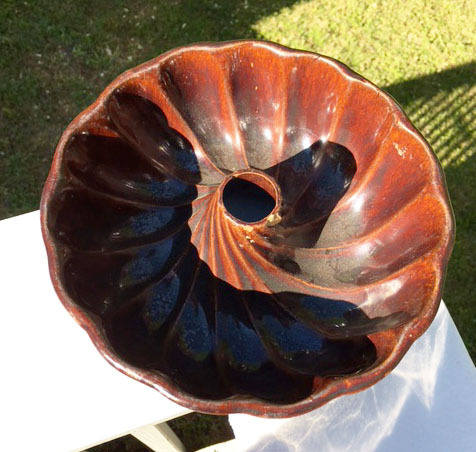 Another yellowware piece, nice bundt type baking piece. 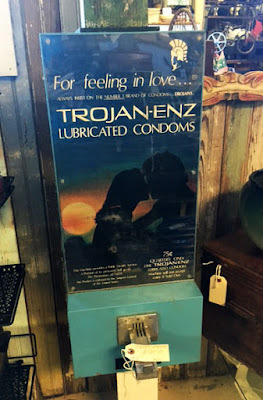 Found this in a thrift store as well. 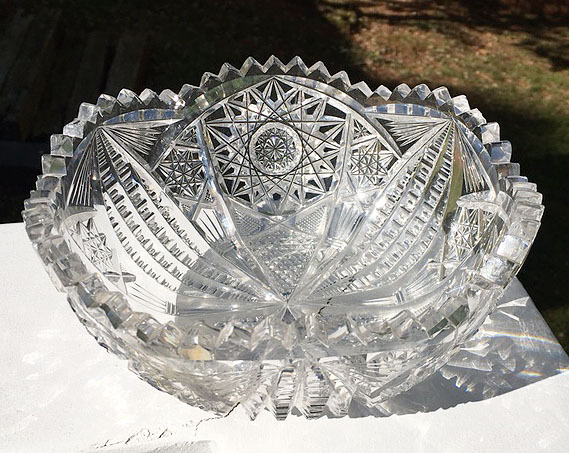 Stunning American Brilliant cut crystal bowl has a few chips along the edge but boy does it throw rainbows. 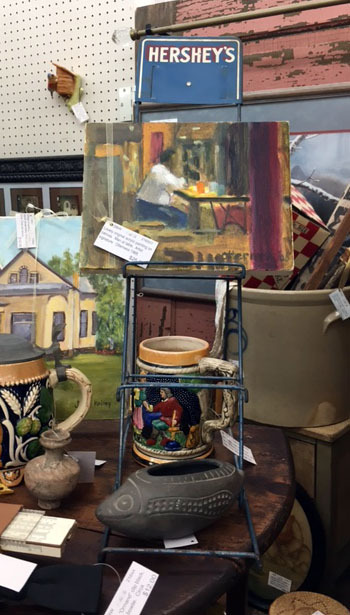 Still wrestling with keeping it or bringing it to my space for sale. 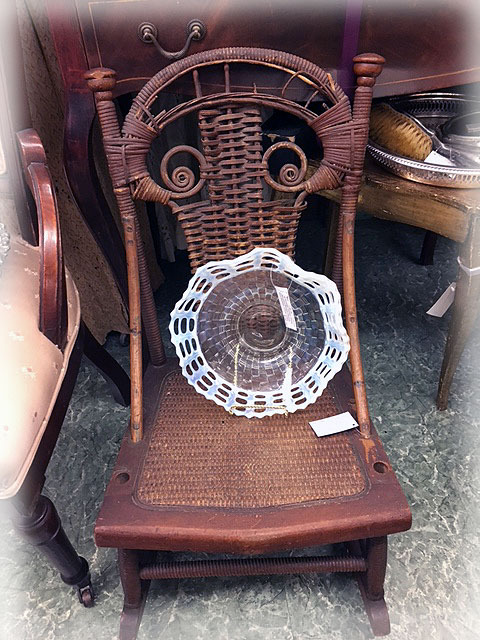 Pretty little Victorian child's rocker displays a lovely vintage Fenton opalescent bowl. 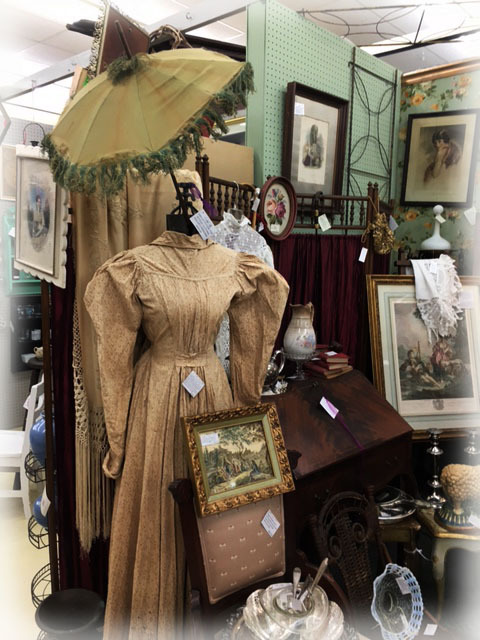 Get your Steampunk on with this antique Victorian parasol. Beautifully carved wood handle, the fabric and tassel's have seen better days since the late 1880s but still look great for over 120 years of use. My Victorian space looks sassy with that sweet little parasol. 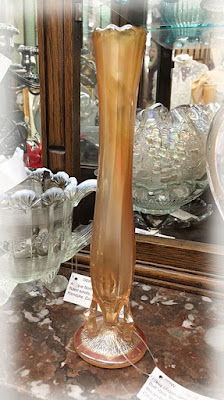 Found this pretty Dugan carnival glass “Beauty” Bud Vase in a local thrift store. Branches bottom supports this pretty bud vase, marigold color. Circa 1909-20s. Lovely Edwardian inkwell. 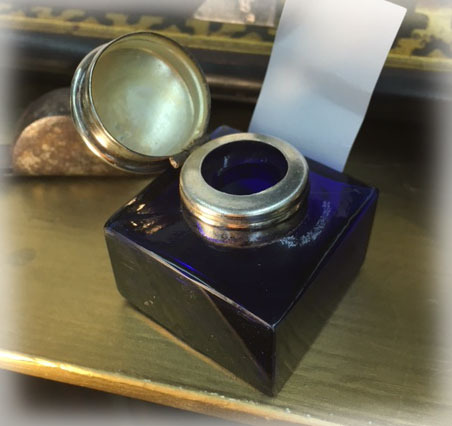 Cobalt blue has damage to one corner. Sterling cap. 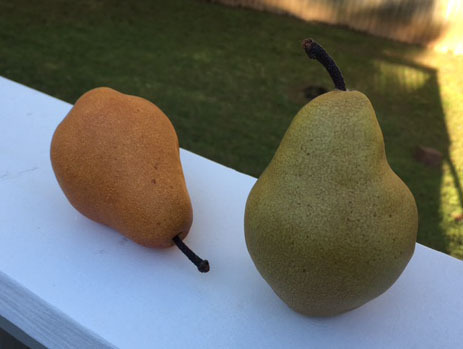 Last by not least, a group of incredibly realistic pears that look good enough to eat. 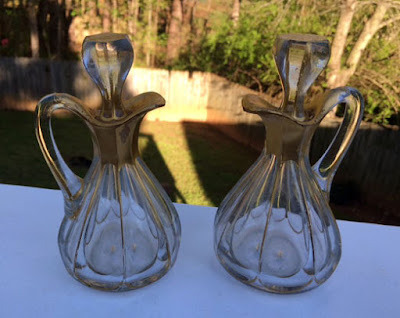 These are well made and have a nice weight to them and a favorite decorative element. As you can see, never found the steel rods for the iron crib so the hunt will go on. In fact, I'm casting this net out there. 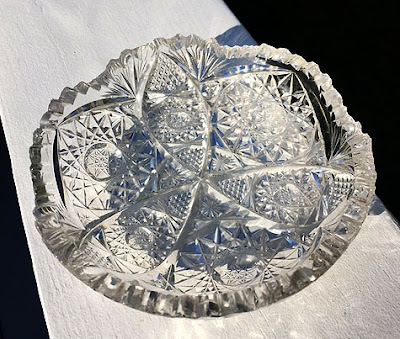 Below are two images of items I am looking for, if you have them for sale, please email me with pictures and price. 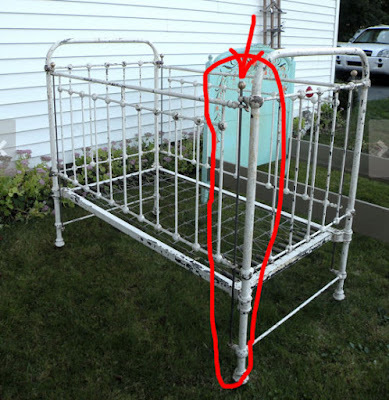 I have the crib but need the steel rods as noted in the red area. I'm going to use it as a monitor table so I need the rods to ensure stability to the crib. 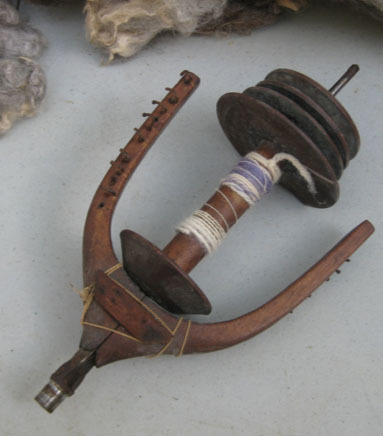 Also looking for a flyer or bobbin assembly for a spinning wheel. I acquired a lovely, antique flax wheel but need the above assembly. 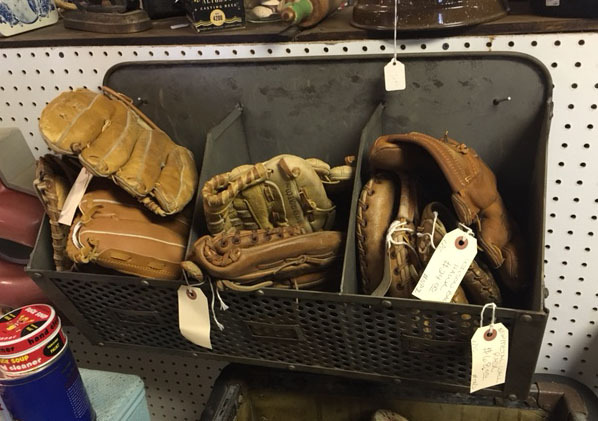 Funny, how you come across these items when you are not looking for them, but when you need them, they all but disappear from sight. Thank you all and blessings to you and those you love, SeaWitch. The, "what I like to call Georgia snow," yellow pollen is here and it is everywhere. It yellows the car, the driveway, the outdoor furniture. It makes walking Gynness a sneeze fest for both of us. Sweet thing's little belly is always covered with yellow from these walks because she is so low to the ground. At least she enjoys her baths. I've been having work done on the exterior of my house, and thankfully, all of the exterior painting was completed before the trees decided to give off the pollen. Now I'm painting the screen door and doing some minor detailing and fighting the pollen along the way. Small blessings, I do not have allergic reactions to pollen which makes me one of the fortunate ones during this season. 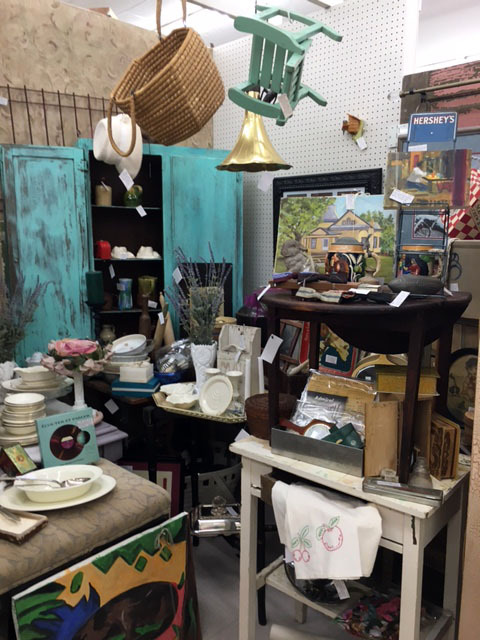 In between the pollen and the painting I did a little purchasing at my favorite thrift shop. Sweet little American Brilliant, cut crystal bon bon dish. This cutie throws amazing rainbows. 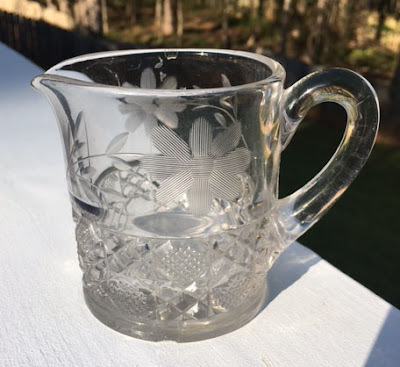 Darling EAPG creamer with etched flowers. 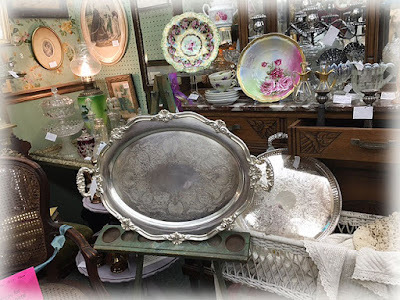 I love using these pieces from the turn of the century. 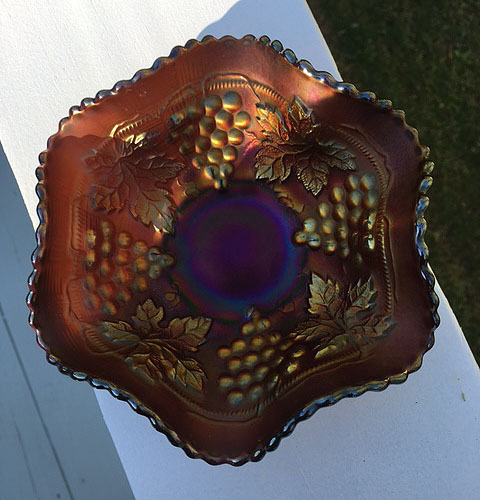 Now this is a keeper, a stunning little Grapes and Cable carnival glass bowl. Purple base with outstanding electric highlights, made by Northwood in 1910. 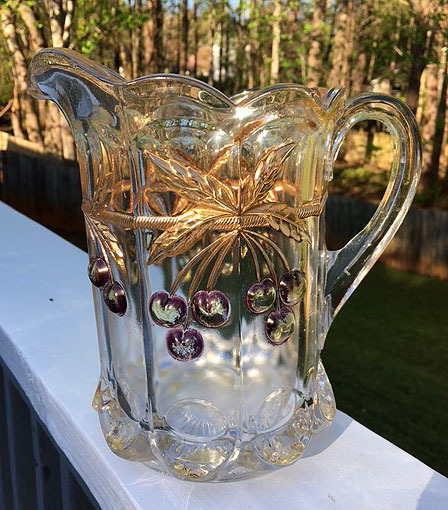 Gorgeous heavy, Victorian Early American Pattern Glass (EAPG) pitcher. Cherry & Cable by Northwood with gold lustre application. 1904. Everyone loves Pfaltzgraff pieces and a huge batter bowl is a great start for your favorite baked goods. 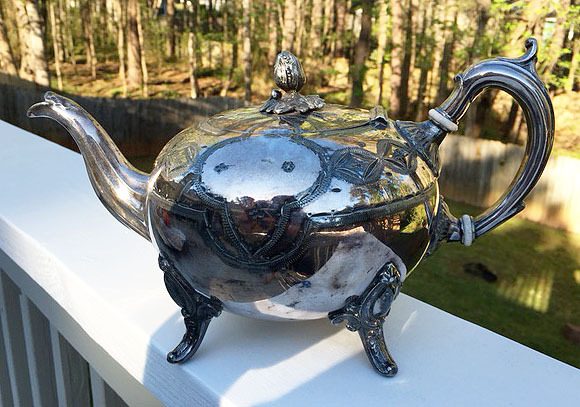 Fabulous Victorian teapot. 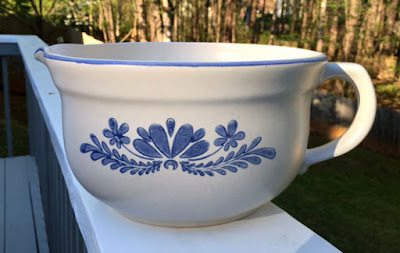 Eastlake pattern with lovely details. Best Electro Plate, English. Circa 1890s. This is one of the prettiest Victorian teapots I have come across in years. 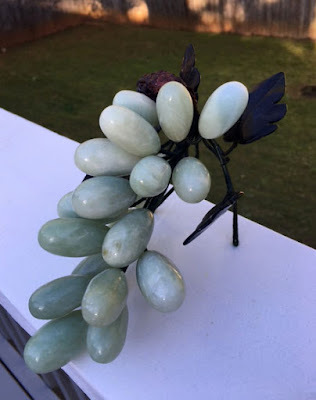 Gorgeous Chinese Jade Stone hand carved and polished clusters of grapes and leaves. Silk bound wires so they can be arranged and moved to shape. Legend said that grapes bring outstanding success, happiness and wealth. This is an older piece whose style was popular in 1950s and 1960s. Lovely turn of the century, Italian oil and vinegar cruet set. Pretty gold lustre cold paint. Circa 1900s. I found a bag of these incredibly life like pears. They are heavy and make wonderful decorative elements. Took most of these finds into my spaces at the Buford Queen of Hearts and did a little fluffing of the booths as well. 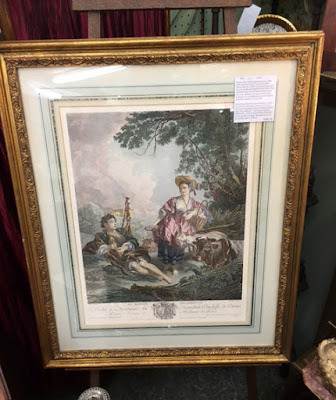 Sold a gorgeous oil painting last week and filled that empty spot with this Original, Rene Gaillard Colored Beautiful engraving of the lovely pastoral print from French Rococo artist, Francois Boucher. (1703-1770) Boucher was one of the most versatile and influential French artists of the eighteenth century. 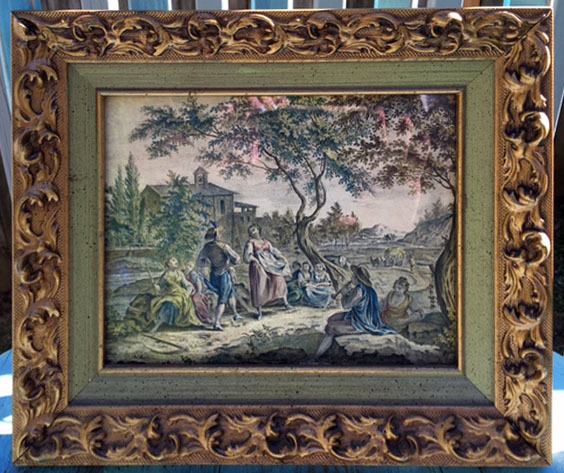 He not only decorated palaces and private residences, but also painted portraits, landscapes, and mythological scenes; and designed opera sets, porcelains, and tapestries. 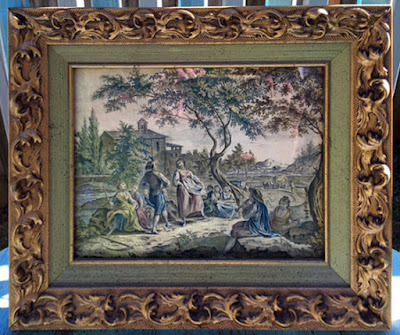 Boucher rejuvenated the 'pastoral tradition' in French art, and was instrumental in developing the Rococo style which characterized French art during Louis XV's reign. 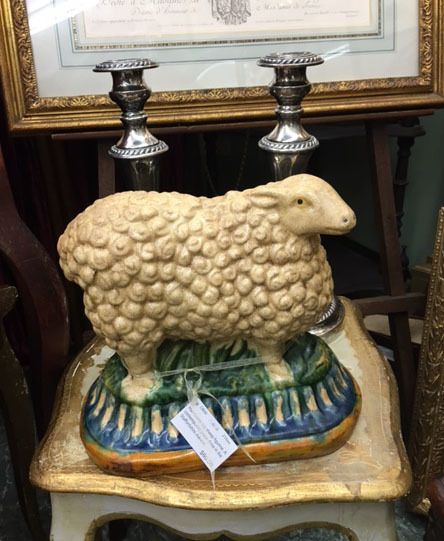 Pretty contemporary Staffordshire sheep is looking for a mantle to reside on. Part of my personal downsizing, this pretty boy sat next to my production spinning wheel for years. Americana at its best. Great collapsible Hersey’s candy bar display. Great red, white and blue original paint. Circa 1930s. 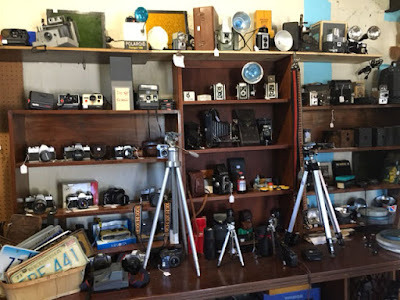 My main space is overflowing with treasure. 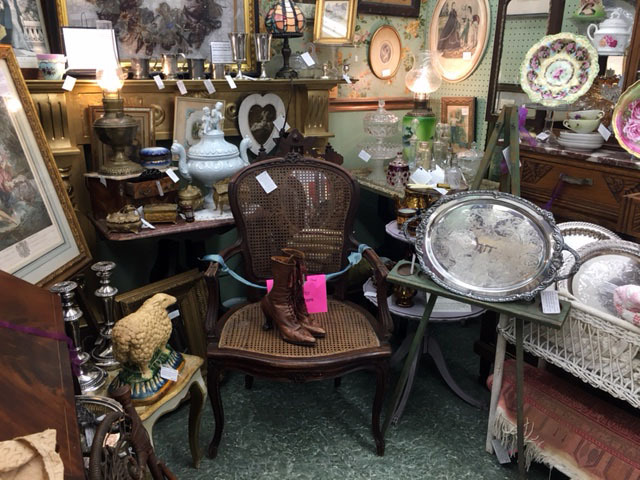 As is my Victorian space. 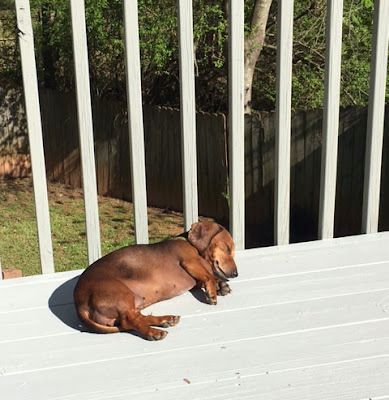 Sweet Gynness likes to snooze in the sun on the freshly painted deck. Here's wishing blessings to you and those you love. SeaWitch & Gynness.